A couple of weeks ago, I came across a small news article explaining that the Idaho Department of Fish and Game had received a permit from the United State Dept. of Agriculture (I think it was Ag) to kill 4,000 ravens. Please sign this petition and reach out in other ways to prevent this massive and unncessary destruction. There is a bias among many people against ravens and crows–their voices are not lyrical and some people see them as bullies or as symbols of evil. But recent studies show that they are among the most intelligent creatures on earth and actually may be the most intelligent. They have complex societies, young stay with their parents for years and they even have a ritual that humans would call a funeral when one of their own dies. Killing 4,000 of these remarkable birds will reverberate through their community for generations. The state of Idaho has received permission to kill up to 4,000 ravens, a bird that is protected by federal law. The justification for this killing is that ravens prey on sage-grouse eggs, a bird which is finally being put onto the endangered list. Yet of the 19 reasons for the sage-grouse's declining numbers, predation by other wild life comes in at #12. Why is the highly intelligent raven being singled out for destruction, especially before other causes are addressed? Ravens are among the most intelligent creatures on the planet. Please sign this petition and reach out in other ways to prevent this massive and unncessary destruction. UPDATE: On April 4, there was news that the state plans to start placing poisoned eggs in three separate areas of the state sometime this spring. The ravens are hard to kill with guns, the article said, because they are so smart. There is still time to stop this if we try. A couple of weeks ago, I came across a small news article explaining that the Idaho Department of Fish and Game had received a permit from the United State Dept. of Agriculture (I think it was Ag) to kill 4,000 ravens. This is proposed under the guise of protecting the sage-grouse, which, I believe, is being added to the endangered species list. The sage-grouse does need protection but here’s the problem. There are 19 factors that have caused their populations to decline, most the result of human activity. 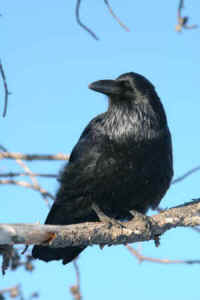 Predation by other creatures is #12 and ravens are the only ones that have been singled out, although there are many. Killing ravens will do little if anything at all to mitigate the problems the sage-grouse face. I was so upset that I took it on myself to create a petition and I hope some of you will consider signing it. And just so you know, I have NO financial or professional interest in this. It is a simple act of love. I have long adored ravens and crows. And Edgar Allen Poe, too.